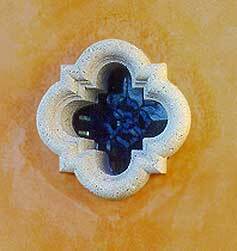 Cast stone quatrefoils are classic architectural details, and cast stone quatrefoils by Wassmer Studios are handcrafted with the highest grade cast stone materials. The result is the sharpest detail and greatest durability available. Call or email to receive a drawing of our various cast stone quatrefoil sizes or to request samples of our smooth and travertine cast stone.